A culmination of the elegance found within the Xcalibur Collection, this espresso brown 5 piece dining set at RC Willey is sure to become a powerful centerpiece in your dining room. With four dining room chairs featuring an oatmeal white upholstery on an espresso brown finish and slatted back design, this affordable dining room set is both sleek and comfortable. The round dining table boasts a limed or whitewashed appeal on the tabletop which causes the wood grain to pop, creating a charming and cohesive look that will help this dining room set to fit in with any existing dining room decor. With the ability to extend the table, this wood dining set is not to be taken lightly, don't miss out and get yours today! 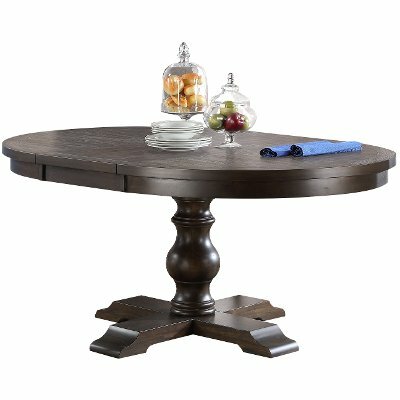 This espresso brown round dining table is the crowning piece of the Xcalibur Collection that RC Willey now offers. A limed finish on the tabletop gives the table a distinct whitewashed elegance that will play wonderfully with almost any existing dining room decor. With the ability to expand and retract, your family of any size will easily fit around this table come dinner time or game night. Pair with the beautiful chair styles of the Xcalibur Collection for a beautiful and affordable dining room set. Slat back construction and oatmeal colored upholstery come together to create a truly magnificent espresso brown slim dining room chair offered at RC Willey today! 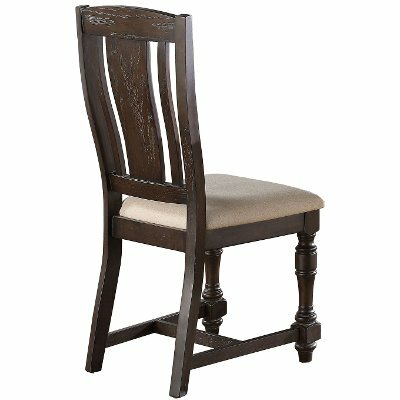 A unique design with turned front legs and an overall slim appearance, this dining chair will make an excellent addition to your dining room. Pair with the other items of the Xcalibur Collection for a shining and unique dining room set.